The medieval Cathedral’s three main entrances still exist today, although due to successive modifications, they lost the unity of their iconographic programmes, which depicted the history of Salvation. Pilgrims originally entered through the north or Paradise door, where they saw scenes of the fall into sin and the promise of Redemption. After visiting the church, they left via the south or Platerías door, illustrated with the fulfilment of that promise by way of the life of Jesus (Incarnation, Preaching and Passion). Finally, in the west they found the “Pórtico de la Gloria,” then visible from the exterior, which showed them the Heavenly Jerusalem they would attain after the Final Judgement. 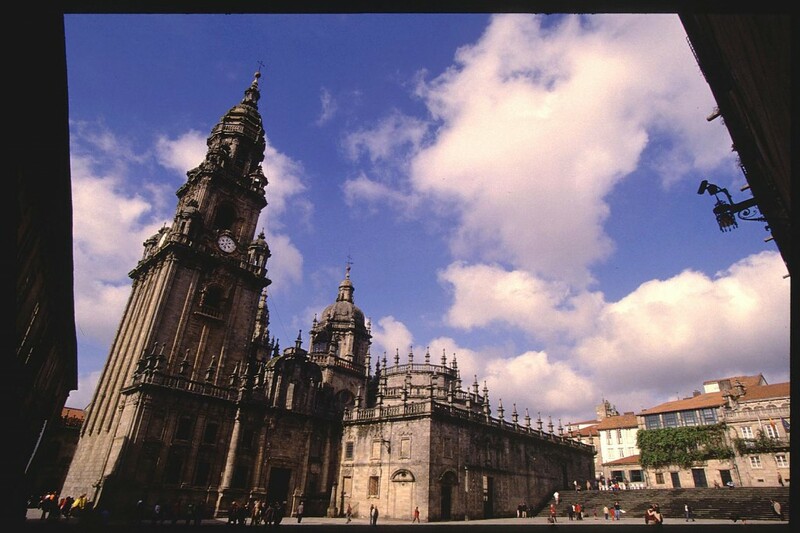 Today, the Cathedral displays a Romesque façade, the Platerías one in the south; two baroque façades, the Obradoiro one to the west and the section of the Holy Door to the east; and a Neoclassical one, the Azabachería or Inmaculada one, to the north. The most photographed picture of the Cathedral is its portentous west façade, called Obradoiro because of the prolonged presence of the workshops (“obradoiros” in Galician) of the masons, who laboured for almost 100 years on the construction of this large baroque curtain from the 17th and 18th c.
Up to then, the Cathedral’s west façade consisted of two Romanesque towers of cubical robustness and unequal height, and a beautiful double façade devoted to the Transfiguration of Christ. Its doors, open day and night, left the grand “Pórtico de la Gloria” uncovered and visible from the area of open ground outside. 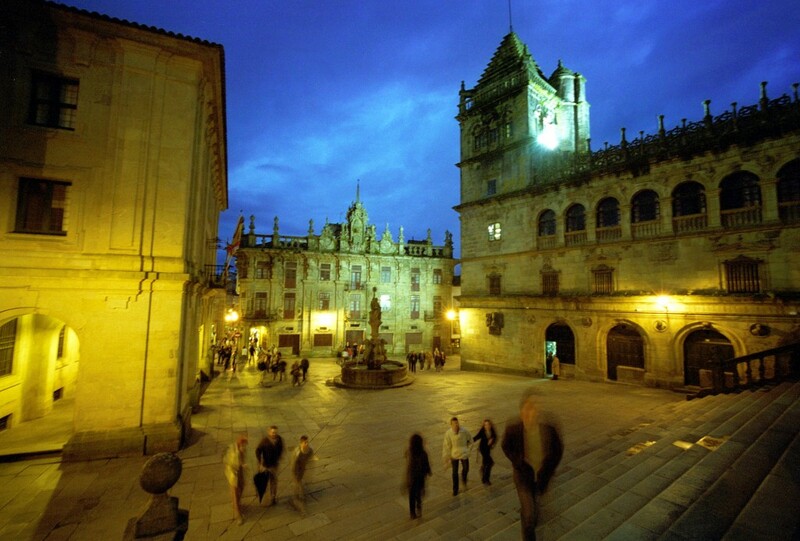 The future Plaza del Obradoiro would be urbanised very slowly. With the construction of the Royal Hospital (1501) and the new Cathedral cloister (1521-1614), the organisation of this public space finally began. However, the greatest change was introduced as of 1650. Baroque remodelling completely renewed the Cathedral exterior. 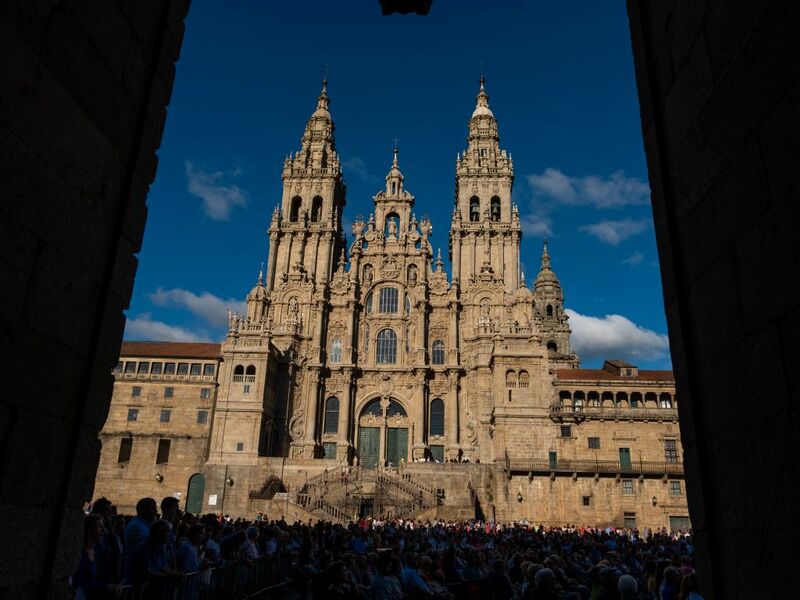 The teams of Peña de Toro, Domingo de Andrade, Casas y Novoa, Lucas Ferro Caaveiro and Clemente Fernández Sarela succeeded each other to erect the Cathedral’s complex main façade and its slender towers, which represent the culmination of the development of Compostela’s baroque art. 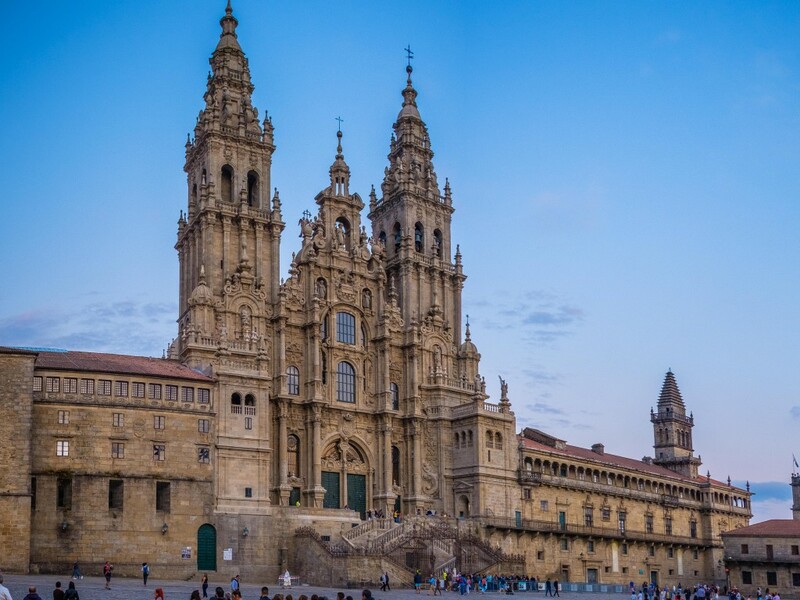 The towers attained their height of 74 metres in 1747, when the architect Fernando Casas y Novoa, following the interventions initiated in 1670 by Peña de Toro and continued by Domingo de Andrade, decided to raise and equal both towers with their splendorous baroque tops. The Tower of Las Campanas, on the right, and the Tower of La Carraca, on the left, give the façade a strong vertical effect of rising up to the heavens. Between the towers is the large mirror-altarpiece, a spectacular combination of granite and glass with giant columns and the largest windows that had been seen in Europe before the Industrial Revolution. In 1750, the statue of St. James the Pilgrim was raised up to its position dominating the triptych, flanked by angels carrying the Crosses of St. James. Further down, the disciples Athanasius and Theodorus keep watch over the sarcophagus. Coats of arms, volutes, cylinders, pyramids, obelisks and other geometric shapes (which are said to have originally been polychromed and gilded) make up an admirable effect of light and shade that shines at dusk and overwhelms in nights of mist. 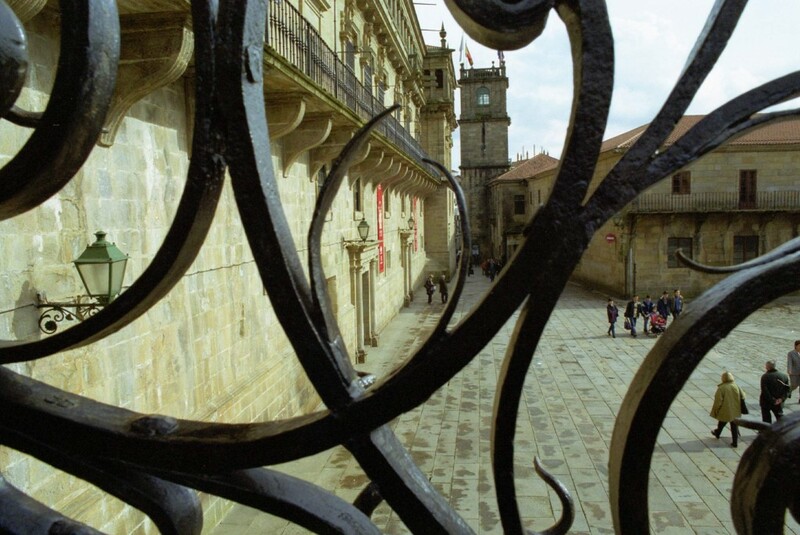 The Obradoiro stairway was built between 1594 and 1600 by Ginés Martínez, inspired by similar works by Michelangelo, Donato de Bramante and Diego de Siloé. The result is an ingenious combination of two stairways, one inside the other, to double the possibilities of entering and exiting. Behind the railings is the crypt, and above it, a vestibule or viewpoint that serves as an anteroom to the west entrance. Also called the “Old Cathedral,” it was built between 1180 and 1200 by Maestro Mateo as part of the symbolic ensemble of the Heavenly Jerusalem, which also includes the “Pórtico de la Gloria” and the upper gallery. 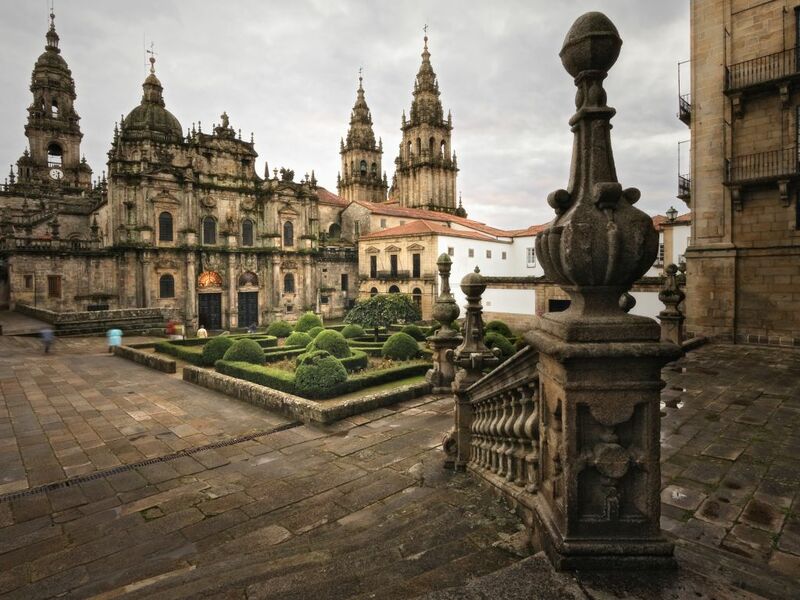 Its material function is that of serving as the base and foundation of the Portico, on the one hand, and overcoming the large different in height (12 metres) between the sanctuary (in Plaza de la Quintana) and the foot of the Cathedral (in Plaza del Obradoiro). Its entrance portal contains a sculpture of St. James Alphaeus or the Less, to whom the crypt is dedicated. It can only be visited inside with a Cathedral Museum ticket. 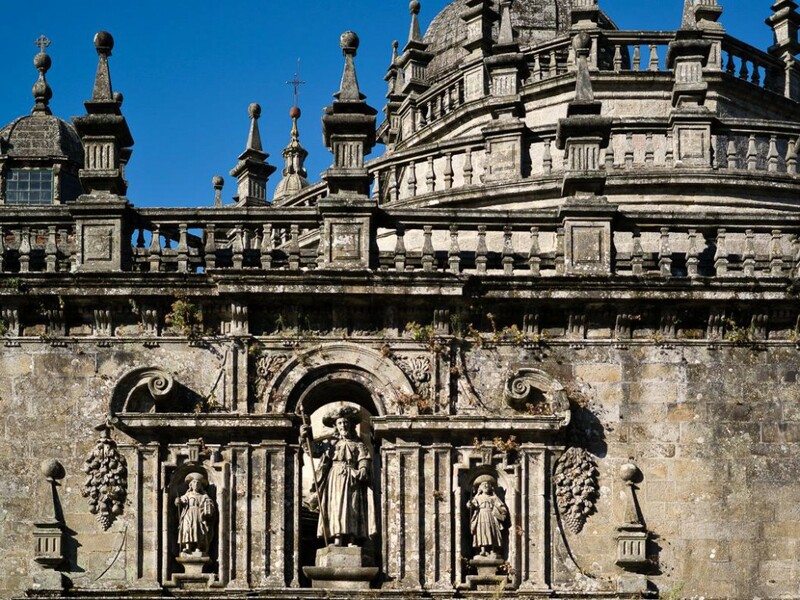 The Obradoiro façade provides a striking contrast to the horizontality of the cloister, on its right, and the Archbishop's Palace of Gelmírez, on its left. The cloister was built by order of Archbishop Alonso de Fonseca between 1521 and 1614. Its large Renaissance ground plan, designed by Juan de Álava, Gil de Hontañón, Juan de Herrera and Gaspar de Arce, replaced the 13th-century Gothic cloister, which in turn had been erected instead of the original, built in 1114. 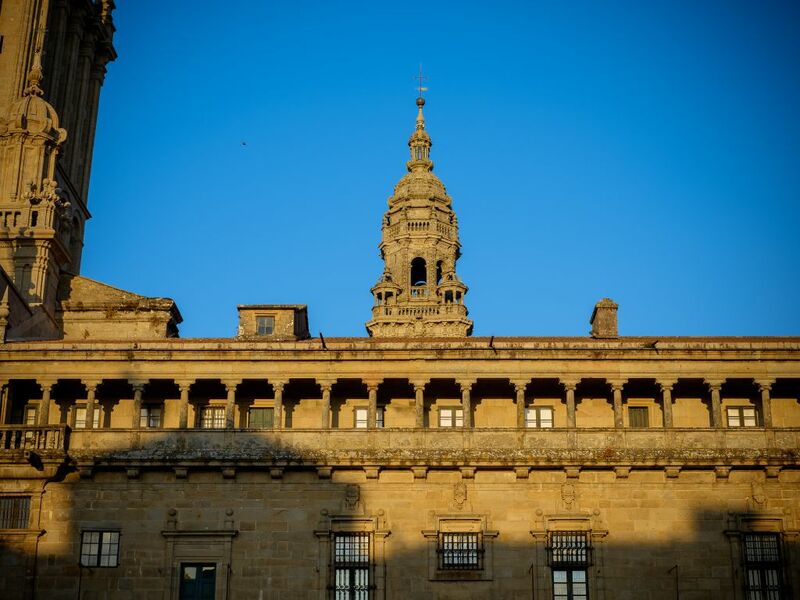 In relation to the cloister exterior, it is worth highlighting both its Obradoiro façade, known as the Running Balcony Gallery and designed by Jácome Fernández in 1615, and its east section, which faces Plaza das Platerías. From both sides we can see its stepped towers, Tower of La Vela and Tower of the Treasury, for whose design Fernçandez was inspired either by the Mausoleum of Halicarnassus and Mesopotamia or by pre-Columbine pyramids. The cloister can only be visited inside with a Cathedral Museum ticket. The Cathedral’s only remaining Romanesque façade is found in the south side, looking onto Plaza de Platerías, compressed between the cloister section and the Clock Tower. 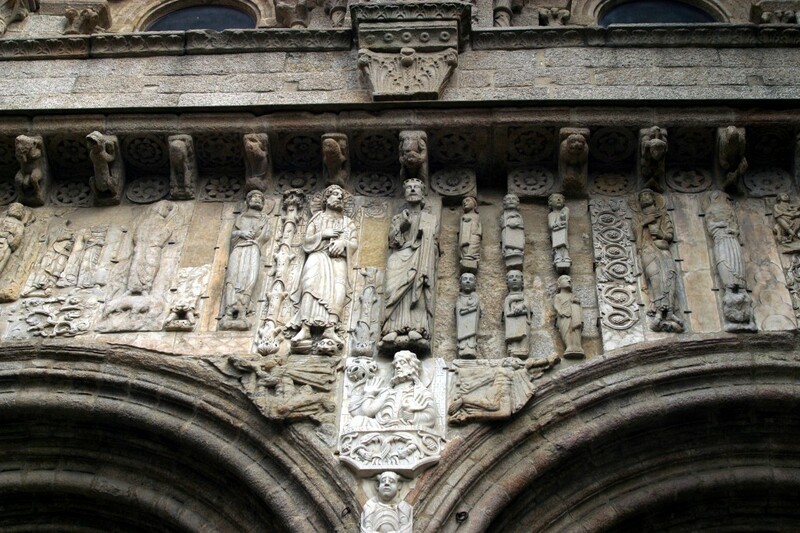 It dates from 1078 or 1173 and is attributed to the master Esteban, the builder of the Romanesque Cathedral of Pamplona and the sculptor of the portals of San Isidoro in León. 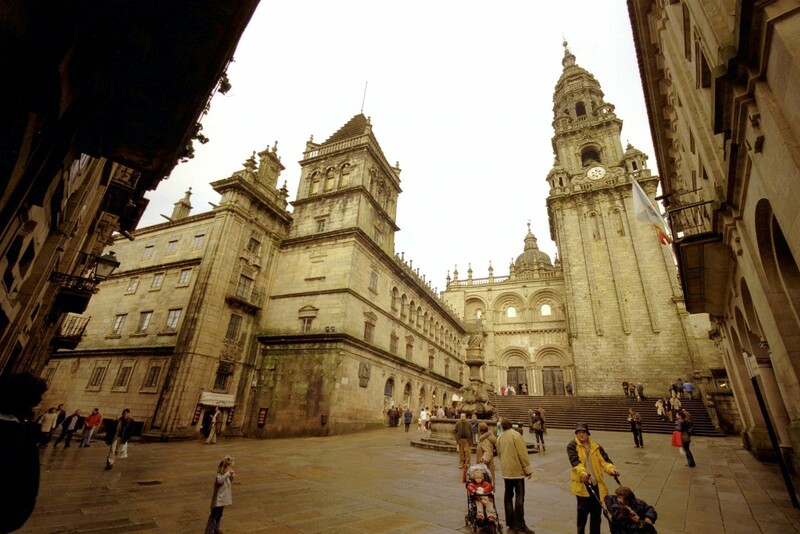 This portal has always been the medieval basilica’s most “urban” one, since it gave pilgrims access to the main city streets when Plaza del Obradoiro was still a quagmire. Moreover, this south vestibule of the church was where justice was administered by Archbishop Gelmírez. 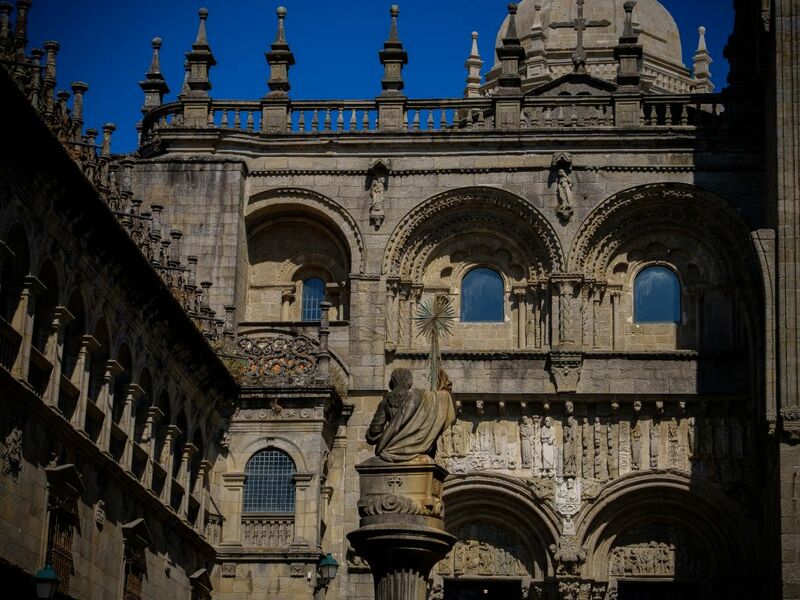 His growing unpopularity led to an uprising in 1117, which destroyed the neighbouring archbishop’s mansion (later rebuilt in its present-day Obradoiro location) and burned the master Esteban’s beautiful façade, which was never the same. The iconography was rebuilt a few years later, and in the following centuries, Romanesque figures from the Cathedral’s north entrance were added to it. This created a surprising ensemble due to its abundance… and disorder. The frieze, for example, features a combination of apostles, angels, zodiac signs and depictions of Sin, such as the mermaid or the centaur. The centre is occupied by a stylised Christ, with St. James at his side. In the middle of the arches we can recognise Abraham coming out of the tomb and Moses depicted, as Michelangelo would centuries later, with horns. The side walls also made use of sculptures from the ruined Door of Paradise, such as the creation of Adam and Eve or King David on his throne. Below the frieze, the double portal is devoted to the double human-and-divine nature of the Son of God. The tympanum on the left depicts the Temptation of Christ, with added figures such as the famous adulteress with a skull in her lap. The tympanum on the right features scenes ranging from the Epiphany to the Passion, the Judgement by Pilate, the Arrest, the Flagellation and the Betrayal by Judas. The Platerías portal borders that of the Clock Tower, which is popularly called “Berenguela” because of Archbishop Berenguel de Landoira, who finished its construction in the 14th century. At that time, it was a robust defensive cube crowned with battlements, whose height was no greater than the present-day position of the clock. In 1680, the architect Domingo de Andrade made the tower one of the most beautiful in Europe: at the top of the original Gothic cube, he added an initial square section perforated with porticos, and above it, an octagonal section crowned by a lantern, which is lit during Holy Years to show pilgrims the way. Baldachins and turrets complete the ascension, with decoration featuring Jacobean and plant motifs. The tower houses the Cathedral’s largest bell, also known as Berenguela. The original from 1678 cracked and was replaced by the current one, which weighs 6,433 kilos and resounds with a profound C when the 19th-century clock, with its single hand, strikes the hour. It is said that if there are ever 13 strokes at midnight instead of 12, the Devil will have an extra magical hour to roam around. The right angle with Platerías façade, the cloister section (16th c.) designed by Juan de Álava, is reminiscent of small Renaissance palaces, with coats of arms and medallions depicting kings and archbishops. The first floor features other medallions with scenes inspired by the Jacobean tradition, such as his relics being brought by boat, his burial or transfiguration into St. James the Moor-slayer. At the top, the medallions correspond to Christ’s genealogy and culminate, in the right-hand corner, with Mary and the Child. At the bottom of the cloister, it is also worth highlighting the shops of the silversmiths, after whom the square has been called since before the 15th c. Although the traditional workshops disappeared in the mid-20th c., today the cloister basement houses shops and jeweller’s that bring them to mind. After these we come to the so-called “Esconce del Tesoro,” a skilful reduction of the corner designed by Casas y Novoa in 1720, to join the façade and cloister without taking away space for moving around the square. The Cathedral’s Romanesque sanctuary is hidden in Plaza de la Quintana, behind a long baroque wall crowned by pinnacles. This length of wall was designed by Peña de Toro and Domingo de Andrade, who, in the 17th century, gave the Cathedral’s entire west side en elegant ensemble image, visually unifying the Clock Tower, Royal Door, Holy Door and Door of Los Abades. The starting point of the baroque remodelling was the construction in 1657 of the Royal Portico, the royal entrance that contrasts with the Clock Tower rising up beside it. Its composition features giant orders and it is decorated with Carlos V’s coat of arms. It now houses the Cathedral shop. But the centre of attention for pilgrims is the Holy Door, which, since the 16th c., leads directly to the ambulatory and the apostle’s relics. It only opens during the Holy Year, which is held whenever St. James’ Day (July 25th) falls on a Sunday. Going through it, having fulfilled the conditions of confession and communion, enables worshippers to obtain the Jubilee. The section of the Holy Door is framed by 24 statues taken from Maestro Mateo’s stone choir, which was dismantled in the 16th c. At the top, it is worth mentioning the sculptures depicting St. James and his disciples, Athanasius and Theodorus, the work of Pedro do Campo in 1694. The bronze door was designed in 2004 by the Galician sculptor Suso León. 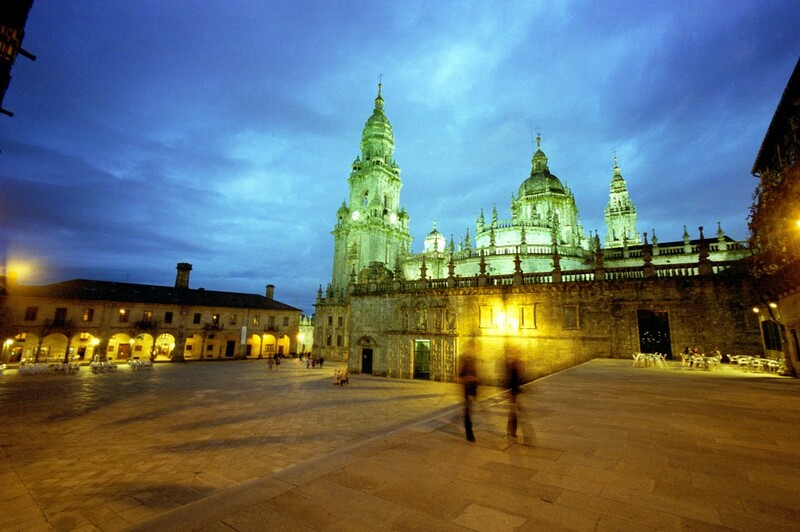 The Cathedral’s north square is called Plaza de la Inmaculada, but it owes its popular name (Azabachería) to the traditional presence of jet-stone workshops. The French, Original, North and English pilgrimage routes lead into this square: it is therefore the first view of the Cathedral that pilgrims see. 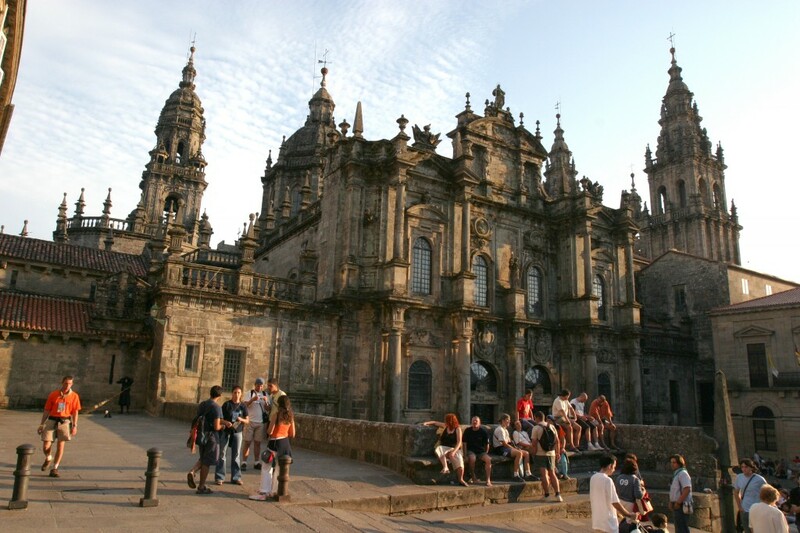 Although most pilgrims today continue on and prefer to enter the basilica via the Obradoiro façade. From the Codex Calixtinus, we know that during the Middle Ages travellers entered through the admirable Door of the Paradise in the north. The 12th-century Codex Calixtinus described it as a marble work profusely sculpted with scenes from Genesis, ranging from the Creation to Original Sin, designed to evoke both the Biblical Eden and the Door of Paradise in St. Peter’s Basilica in the Vatican. In front of it there used to be the Fons Mirabilis, a fountain that has now been moved to the cloister, which surprised pilgrims with its channeling of water and gave them a chance to wash before entering the Cathedral. Shells, wineskins, shoes, leather bags and all kinds of medicinal herbs were sold in the surroundings. Close by were the moneychangers’ houses and the Pilgrim Hospital. A fire and the construction of the new baroque façade displaced many original elements to the Platerías façade. The present-day façade was erected between 1757 and 1770, based on a design by Ferro Caaveiro to unify the square, equal the splendour that had recently been attained by the neighbouring Monastery of San Martín Pinario and extend the Episcopal Palace, which is attached to the Cathedral in the northwest. Since it was the result of a transitional period, its design features a combination of baroque and Neoclassical styles. Clemente Fernández Sarela built the lower section, which has a predominance of two large archbishopric coats of arms; and Domingo Lois de Monteagudo (who intervened by decision of the Academy of Fine Arts to “update” the style towards Neoclassicism) made the upper section, in Ionic style and dominated by the image of Faith with her eyes blindfolded. The figure of the apostle rises up at the top of the pediment.